High Impact Practice:Offer contraceptive counseling and services as part of facility-based childbirth care prior to discharge from the health facility. WHO recommends that women receive information on family planning and the health and social benefits of birth spacing during antenatal care, immediately after birth, and during postpartum and well-baby care, including immunization and growth monitoring.12 Each visit to a health professional offers a unique opportunity to screen for, counsel, and offer family planning services. Yet each opportunity requires deliberate attention to organize services, update policies and provider practices, and mobilize resources for successful implementation. Facility-based childbirth services offers an ideal platform to reach women and their partners with family planning information and services, provided women’s right to make a full and informed choice are respected. Immediate postpartum family planning (PPFP) is one of several proven HIPs identified by a technical advisory group of international experts. A proven practice has sufficient evidence to recommend widespread implementation as part of a comprehensive family planning strategy, provided that there is monitoring of coverage, quality, and cost as well as implementation research to strengthen impact.13 For more information about other HIPs, see http://www.fphighimpactpractices.org/overview. Offering Family Planning Counseling and Services at the Same Time and Location as Facility-Based Childbirth Care: Theory of Change | Assumption: There are high levels of facility-based births among the target population. An increasing number of women and their partners can be reached through facility-based childbirth services. Globally, 4 of 5 births take place with the assistance of a skilled birth attendant, and increasingly these births are taking place in health facilities.20 For example, in Bangladesh, deliveries in health facilities increased from 17% to 37% between 2007 and 2014. During a similar time frame, facility deliveries increased from 39% to 72% in Burkina Faso and from 43% to 64% in Kenya.21 As countries continue to strengthen facility-based childbirth care, this will be an increasingly important platform to reach women and their partners with family planning services. * Hospital Escuela, the government-run hospital. † Hospital Materno-Infantil in Tegucigalpa, the Honduran Social Security System. Invest in good documentation and monitoring to help ensure voluntarism and informed choice. Childbirth can be a stressful and challenging time for women. Clear documentation and recordkeeping, along with consistent monitoring, can help programs assess progress while ensuring clients’ rights are protected. For example, when counseling is provided during antenatal care, method choice should be indicated on the client’s record, whether it be a woman-held card or a facility chart. This documentation facilitates communication across providers who are caring for the same client and ensures continuity of care. The record should emphasize method choice or refusal, rather than whether or not counseling was provided. Update national service delivery guidelines and clarify the role of service providers. This is particularly critical if existing guidelines reflect delayed start of progestin-only methods, like implants, which are now an option for immediate PPFP use according to WHO’s 2015 Medical Eligibility Criteria for Contraceptive Use (5th edition).22 Guidelines as well as job descriptions should clearly articulate that all antenatal and maternity care providers have a role in PPFP, and that it is not just the responsibility of a few trained provider(s). The role of community health workers in promoting PPFP can also be specified. Consider leveraging antenatal care visits to educate clients on contraception. While the effect of including family planning counseling as part of antenatal care on increased PPFP uptake is unclear, doing so allows women to fully explore their intentions and to make an informed decision about contraception before delivery.42 Counseling earlier during a pregnancy may be particularly helpful if introducing IUD or sterilization as women often need more time to consider and discuss these options with their partners. Do not forget men. Male involvement during and after pregnancy can reduce the occurrence of postpartum depression and improve use of maternal health services, such as skilled birth attendance and postnatal care.43 The effect of male involvement in maternity care on postpartum contraceptive use is unclear.43 Yet inequitable gender norms have a powerful effect on women’s ability to make and act on decisions about birth spacing and limiting. Providing men and women the opportunity to engage in family planning discussions as part of maternity care—together or separately—can directly address these inequitable norms and create space for joint decision-making for effective use of family planning. Plan for contraceptive uptake later during the postpartum period. In Rwanda, the PPFP counseling session is an opportunity to make a plan for returning to a facility for postnatal care and immunization and for obtaining a PPFP method at that time. Data from one quarter in 2017 from 10 districts showed that 24% of women adopted a method pre-discharge and an additional 67% left with a plan of when to start. Immunization services tend to reach high coverage and provide a possible platform for linking or integrating family planning services (see related HIP brief on Family Planning and Immunization Integration). Kouyate RA. LAM and the transition barrier analysis: Sylhet, Bangladesh. Baltimore, MD: Jhpiego; 2010. https://www.k4health.org/sites/default/files/ACCESS_FP_LAM_Barrier_Rept_Final_June_2010_web_0.pdf. Accessed October 17, 2017. UNICEF. Despite accelerated recent progress, millions of births occur annually without any assistance from a skilled birth attendant at birth. UNICEF Data: Monitoring the Situation of Children and Women website. Updated June 2017. https://data.unicef.org/topic/maternal-health/delivery-care/#. Accessed August 9, 2017. STATcompiler, The DHS Program. Indicator: Percentage of live births in the five (or three) years preceding the survey delivered at a health facility. http://www.statcompiler.com/. Accessed May 2, 2017. Maternal and Child Survival Program. 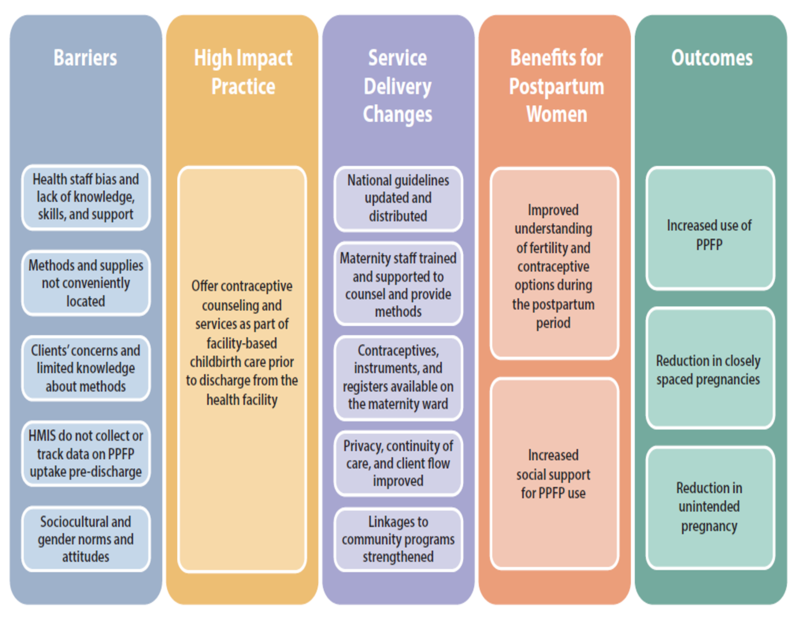 Pathway of opportunities for postpartum women to adopt family planning. Baltimore, MD: Jhpiego; 2015. http://www.mcsprogram.org/resource/pathway-of-opportunities-for-postpartum-women-to-adopt-family-planning/. Accessed October 17, 2017. Chitashvili T, Holschneider S, Clark P. Improving quality of postpartum family planning in low-resource settings: a framework for policy makers managers and medical care providers. Bethesda, MD: University Research Co., LLC (URC); 2016. https://www.usaidassist.org/sites/assist/files/improving_quality_of_ppfp_apr_2016.pdf. Accessed October 17, 2017. This brief was written by Laura Raney, Anne Pfitzer, Trish McDonald, Erin Mielke, Elaine Charurat, Aachal Devi, and Shawn Malarcher. Critical review and helpful comments were provided by Afeefa Abdur-Rhaman, Ribka Amsalu, Michal Avni, Maggwa Baker, Neeta Bhatnagar, Rosanna Buck, Megan Christofield, Arzum Ciloglu, Kim Cole, Temple Cooley, Chelsea Cooper, Carmela Cordero, Ana Cuzin, Peggy D’Adamo, Ellen Eiseman, Mario Festin, Coley Gray, Karen Hardee, Nuriye Hodoglugil, Caroline Jacoby, Emily Keyes, Joan Kraft, Cate Lane, Samantha Lint, Ricky Lu, Sara Malakoff, Janet Meyers, Pierre Moon, Dani Murphy, Winnie Mwebesa, Maureen Norton, Gael O’Sullivan, Saiqa Panjsheri, Alice Payne Merritt, May Post, Shannon Priyor, Heidi Quinn, Setara Rahman, Elizabeth Sasser, Ritu Schroff, Caitlin Shannon, Willy Shasha, Jim Shelton, John Stanback, Sara Stratton, Caitlin Thistle, Carroll Vasquez, Michelle Weinberger, Jessica Williamson, and Melanie Yahner. This HIP brief is endorsed by: Abt Associates, CARE, Chemonics International, EngenderHealth, FHI 360, FP2020, Georgetown University/Institute for Reproductive Health, International Planned Parenthood Federation, IntraHealth International, Jhpiego, John Snow, Inc., Johns Hopkins Center for Communication Programs, Mangement Sciences for Health, Marie Stopes International, Options, Palladium, Pathfinder International, Population Council, Population Reference Bureau, Public Health Institute, Save the Children, U.S. Agency for International Development, United Nations Population Fund, and University Research Co., LLC. The World Health Organization/Department of Reproductive Health and Research has contributed to the development of the technical content of HIP briefs, which are viewed as summaries of evidence and field experience. It is intended that these briefs be used in conjunction with WHO Family Planning Tools and Guidelines: http://www.who.int/topics/family _planning/en/. For more information about HIPs, please contact the HIP team at [email protected].